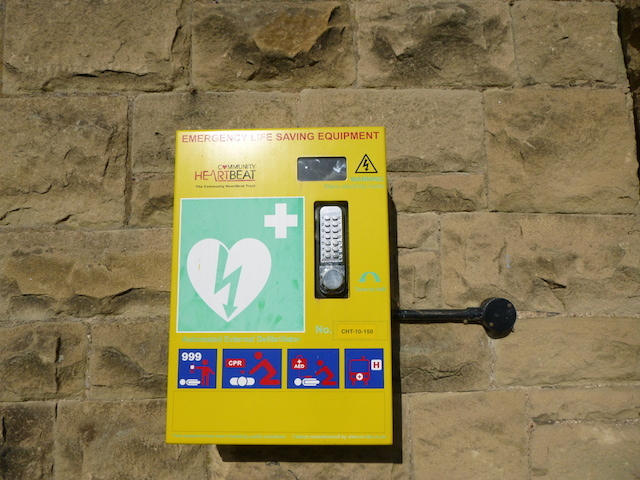 Over the last few years a number of village halls and other public buildings have installed external defibrillators in boxes attached to their walls. A defibrillator is a portable device that checks the heart rhythm. If needed, it can send an electric shock to the heart to try to restore a normal rhythm. They are used to treat sudden cardiac arrest and so can be a real life saver. Alexandra Wheeler of the NE Ambulance Service, produced a report for the Consortium . Help might well be at hand for those halls considering installing a defibrillator unit. The estimated cost of these used to be about £2200 but they may now be obtained at a much lower cost thanks to the Stephen Carey Fund. Following the tragic death of Stephen Carey at the age of 21 whilst playing football for Alnmouth United, his friends, fellow players and family set up a fund in his name. They have several objectives, one of which is to help fund public access to defibrillators in Northumberland. They will help part-fund the defibrillator and the external cabinet, vastly reducing the cost to the village.